The People is our section for all things concerning Black Chicago. In this piece, fellow Chicagoan Mylissa Veal explains how dangerous toxic masculinity results in the death of women. I was following the story on Twitter about an active shooter at Mercy Hospital & Medical Center, refreshing my timeline every few minutes to find out more about it. When the shooter was described, I thought it was some sort of terrorist attack. Well, I was slightly accurate. The terrorist was Juan Lopez, the ex-fiance of Tamara O’Neal, an emergency-room doctor at the hospital. He had come to kill her. My heart sank when I realized she didn’t make it. He succeeded. Tears welled up in my eyes. Why does this keep happening to us? Why can’t men just leave us alone? It’s always the saddest story to tell, but it hits differently when it could have been your story. I never saw myself as someone who could be in an abusive relationship – not the headstrong tomboyish girl who wrestles with the guys, and plays sports. Nothing prepares you for that first physical encounter. I just remember feeling like he wanted me dead as he dragged me, punching the floor around my head. I didn’t fight back like I always imagined I would. I just tried to get through it. My arms felt like John Henry’s hammer, and I was frozen in time. Because, at that moment, I saw the person I love wanting to hurt me. I was in disbelief that I’d become “one of those girls.” In a society that already punishes women for existing, you’d think women would stick together a little better. Unfortunately, there is a small population of women who use these moments as a stepladder in elitism. They try to make it seem like abused women are weak and willful victims. I just have two words to say to women like that: keep living. I would never wish anything bad on a soul, but I pray that you never have to experience the darkness that is abuse. I wish Tamara O’Neal never had to experience this. Abused women are so often blamed for what they endure. We’re told that we’re weak, stupid, and that we ignored the signs. We’re casted out as damaged goods. I was in denial for a long time that my relationship was even abusive. I kept making excuses to myself and saying how it “wasn’t that bad.” All the things that make you feel better about going back to your abuser, I said them to myself and others. Society makes us feel like we’re supposed to forgive and work through things. So I did. As a woman, we’re expected to nurture, and heal, and try to change a man for the better. So I tried. And even when I tried to involve the police when the abuse occurred while I was pregnant years later, society failed me by saying I wasn’t bruised ENOUGH to put him away. I wasn’t hurt enough to save myself. Society failed me, after everything I had done to adhere to its rules. The effects of this relationship still haunt me to this day. 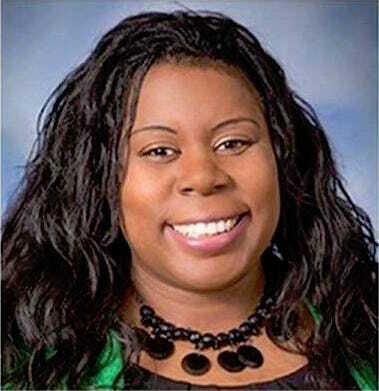 Tamara O’Neal did what society tells us to do. She broke off the engagement. She left, and tried to live her life as best she could. But he killed her, and others too. As the reality of her murder set in, and I scrolled through social media on Tuesday, I came across one of the most vile things I’ve ever read. Some “man” on Facebook said that Tamara set off her ex-fiance because she didn’t give her ring back. This “man” blamed Tamara for her own death, and the deaths of others. The worst part about reading that idiocracy was seeing several people agree with him. The fact that there is a population who thinks this way is scary. That’s a venom we cannot afford to spread. Are we that desensitized and OK with the abuse of women that we’ll find any and every reason to excuse a man who killed a woman? How could she ever be at fault for her own death when she had done everything society tells us to do? 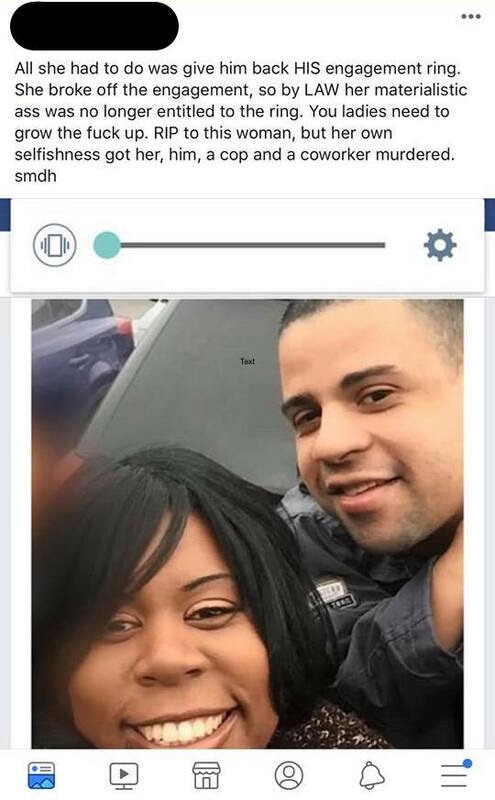 A screenshot of a viral Facebook post by a man discussing the death of Tamara O'Neal. We've blurred out his name and photo to protect his privacy. About five years ago, he was kicked out of the Chicago Fire Department Academy after being put on notice for being aggressive toward women, and abandoning his duties. That same year, his former wife sought a protection order against him after he chased a neighbor with a gun and threatened to “cause a scene” at her workplace. Somehow, he still obtained a valid firearm owner’s identification card, and a concealed carry license, and purchased guns. After all of that, people still blamed O’Neal. How you can dig into the pits of your conscious to blame that woman is beyond me. Over an engagement ring at that? Do men feel that an engagement ring means ownership of our lives? To the women who agreed with that disgusting post, do you feel that the idea of marriage is so important that Tamara should lose her life by not returning the engagement ring? Has patriarchy poisoned our society to the point where women are agreeing that Tamara O’Neal deserved to die over a piece of jewelry? Maybe she was scared to return the ring. We’ll never know because she’s not here to tell us why she didn’t do it. Some women feel that we are only as important as our worth to a man, and there are men who prey on this. It’s a plague that is literally killing hundreds of women every year. Men, please talk to your friends who abuse women. Stop turning a blind eye because it’s “not your business.” Your friends aren’t listening to us. Imagine if it was your friend whose masculinity is so toxic and fragile that it results in the death of a woman. It happens far too often you to still not understand why #MenAreTrash. You may not feel he’ll listen, as I always hear. “I can’t tell that man what to do.” However, if abuse wasn’t so accepted among the people they actually respect, I feel more abusers would change their ways. Just allowing these things to happen further pushes the idea that it is acceptable. Where therapy or counseling may not be an option, a word from you could be the difference in a woman being dead or alive. It starts with the aggressive catcalling, and treating women as objects. Be the change you want to see in the world by speaking up, not just for us, but for men to be better as a whole. Educate your friends, brothers, cousins, sons, and beyond. Our lives literally depend on it. You can’t say it’s “not all men” when you’re turning a blind eye to abuse right in your face. Break the silence, and save lives. O’Neal’s friends have created a memorial fund in her honor: Tamara E. O’Neal Memorial Fund. Click here for more details.